Please note most files are Zipped. If you have any problems please contact me and I will send you the files directly. ► Usage: For personal and small business use only; see shop policy for more details. Easy to download. Very cute papers. Thank you! If you purchased Custom Listing, you will receive the file within 48 hours of purchase to your etsy registered email address. Please note we do not license or sell the rights to any of our designs. All rights are retained by Anchored by Love and the copyright remains with Anchored by Love. By purchasing these designs you are being granted permission to use the graphic(s) in your personal & small handmade business projects. The copyright doesn't transfer to the buyer and you may not resell or share any of the files. Commercial use is restricted to small, handmade companies only (i.e. selling on etsy, Teachers Pay Teachers, your own website, craft shoes, etc.). You must incorporate the graphics into your overall design unless you are selling stickers or nail art. These are the only two circumstances where graphics can be printed and resold as is. 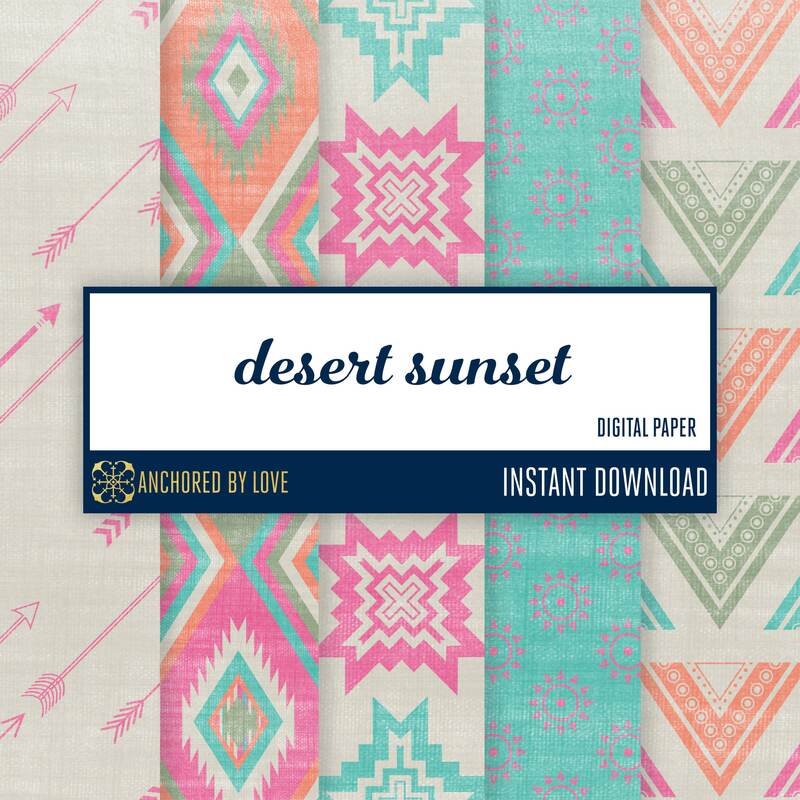 ◦ Printed & Digital Paper Goods: invitations, stationery, party printable, photo cards, monthly onesie stickers, organizers, planners, teacher’s resources, classroom materials and similar items. Digital files must be flattened and sold in PDF or JPG formats. ◦ Personalized Apparel/Fabric Items: Personalized shirts, baby tees, blankets, tote bags etc. are OK as long as you are ONLY selling these in your own shop, website, or on etsy. This is just a partial list of the ways the graphics cannot be used. If your project does not fall under one of the acceptable categories please contact us or assume the graphics cannot be used. ◦ Apparel and Fabric Items: Personalized items are OK under the circumstances listed above. All other items are not allowed at this time. You are responsible for having the ability to unzip/extract the zip file your order will come in. On PC's you can usually right click on the zip and go to "extract all." On a Mac you can double click to open it up. Please note if this isn't done before you try to use the graphics you may get an error message. You will also need design software that supports PNG & JPG files and have the know how to use your program. We recommend Adobe Creative Cloud. If you are unsure whether or not your software will work please download a freebie to try first. If you are new to design and unsure how to use the graphics we recommend looking up tutorials online and watching videos on You Tube. There are some great resources out there! Invitation File Formats || Need help deciding? ◦ JPEG files are for emailing or printing at a photo lab, you will receive a single image that you can upload to a photo lab or online print service such as Shutterfly, Tiny Prints, Walgreens, Costco or CVS (or a store relative to these). ◦ PDF files are for easy printing at home or a local print shop, you will receive one high-resolution file setup to print on US Letter 8.5"x11" paper, with bleed and crop marks. Local print shop locations include, Kinko's, Office Max or Staples (or a store relative to these). For best results we recommend printing on a white heavy card stock at least 80lb. paper. NOTE: colors may vary from different screens to different printers. Make sure to print a test before proceeding to mass production! Anchored by Love will not be responsible for color variations between what you see on your monitor and how it actually prints on paper. What software do I use to edit the printable invitations? https://get.adobe.com/reader/ The latest version of Adobe Reader is "Adobe Reader DC". The invitations CAN ONLY be edited on a computer, it will not work on a mobile device (phone, tablet, etc). Please note that the editables only work in Adobe Reader and will not work in any other graphics program or PDF viewer.